The ruling by Judge George Hugo Boldt of the United States Federal District Court , in what was to become the landmark "Boldt Decision" of 1974, did not translate into social acceptance of treaty fishing rights. Boldt's ruling, along with earlier cases, upheld the legality of treaty fishing rights. However, it was Judge Boldt's interpretation of treaty language to mean that tribes were entitled to "half" of the harvestable catch that led non-Indians, especially sport fishers, to lash out with protests, including burning Judge Boldt in effigy outside the federal courthouse. Political cartoons reflected the public's sentiment, fueled by racism and ignorance of treaty rights. Major opponents to treaty fishing rights were hunting and fishing organizations, not just the state of Washington's fisheries and game departments. 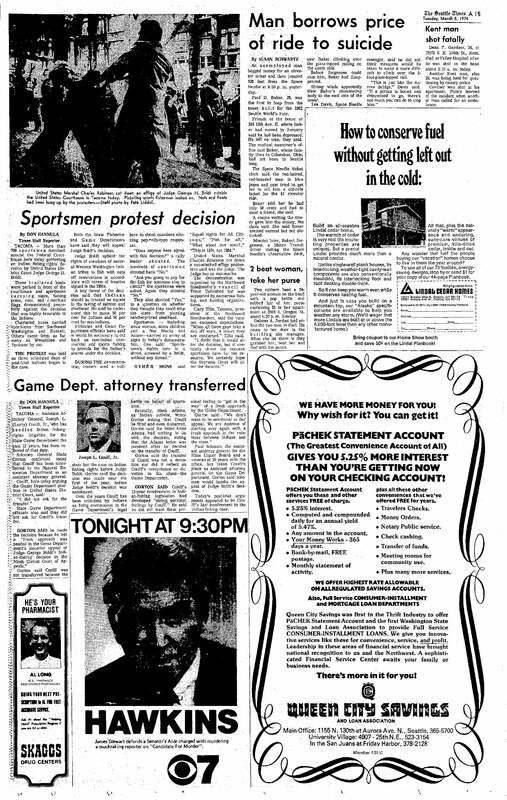 Don Hannula, "Sportsmen Protest Decision," Seattle Times, March 5, 1974. More than 700 sportsmen marched around the Federal Courthouse here today protesting an Indian fishing-rights decision by United States District Court Judge George H. Boldt. Three trailered boats were parked in front of the courthouse and sportsmen carrying signs, fishing poles, nets, and American flags demonstrated peacefully against the decision that was highly favorable to the Indians. 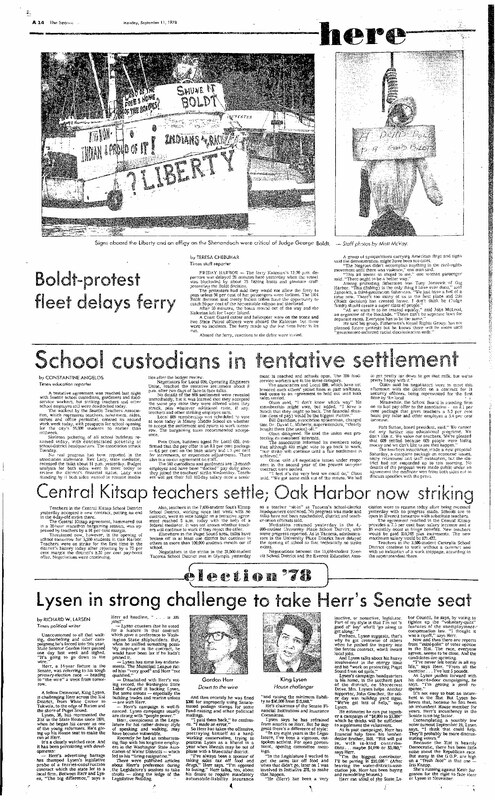 Chartered buses carried sportsmen from Southwest Washington and Everett. Others came from as far away as Wenatchee and Spokane by car. The protest was held as three scheduled days of post-trial motions began in the case. Both the State Fisheries and Game Departments have said they will appeal Judge Boldt's decision. Judge Boldt upheld the rights of members of several Western Washington Indian tribes to fish with nets off reservation in accordance with terms of treaties signed in the 1850s. A key thrust of the decision said that Indians should be treated as equals in the taking of salmon and steelhead. He said he understood this to mean 50 percent for Indians and 50 percent for non-Indians. Fisheries and Game Department officials have said it would be necessary to cut back on non-Indian commercial and sports fishing to provide for the Indian's shares under the decision. During the demonstration, leaders used a bullhorn to shout questions eliciting pep rally type responses. Sportsmen—including some women, some children and a few blacks and Asians—carried an array of signs in today's demonstration. One said: "Sportsmen's rights torn to a shred, screwed by a Boldt, without any thread." Other signs said "Equal rights for All Citizens," "Fish for all," "What about our sons?," "This is 1974, not 1854." The demonstration was organized by the Northwest Steelheader's council of Trout Unlimited but was supported by numerous fishing and hunting organizations. Gary Ellis, Tacoma, president of the Northwest Steelheaders, said the turnout exceeded expectations. "When all these guys take a day off work, it shows they are concerned," Ellis said. "I doubt that it would alter the decision but it certainly shows the concern sportsmen have for the resource. We certainly hope the Supreme Court will alter the decision." And so there was all these things and the state of Washington stood behind them on that, saying, 'Well, the Boldt Decision isn't really in effect until the Supreme Court upholds it.'" The type of discrimination described here was common before, during, and after the Boldt Decision. Indian Voice, published by the Small Tribes Organization of Western Washington in Federal Way, raised the alarm about the backlash, as did other Native publications. This cartoon is from the November 1977 issue. 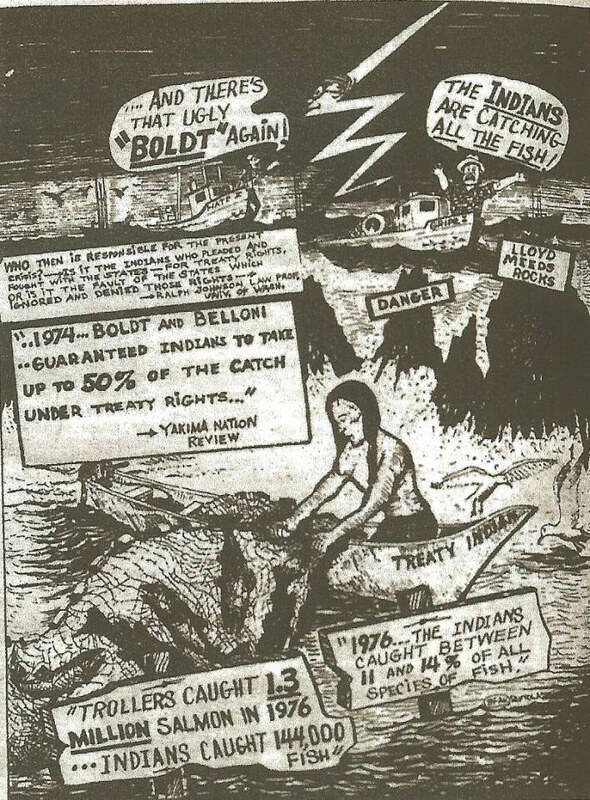 "Belloni" refers to Robert C. Belloni, the federal court judge who reaffirmed treaty fishing rights and ruled that tribes were guaranteed to their "fair share" in his 1968 ruling in Sohappy v. Smith. Indian Civil Rights Hearings, November 1977. Cartoon courtesy of Indian Voice, Small Tribes Organization of Western Washington. "Yeah, well, the Boldt Decision, it was very difficult because there was just this intensity of hate. People would spit on you. And yell at you, and call you names." Racism took many forms during this time. Mel Moon, a citizen of the Quileute Nation, reflects on the treatment he received from non-Indians following the Boldt Decision. Hatred and outrage were expressed in a variety of ways and in a variety of places. The Boldt effigy was hung outside the federal courthouse where Judge Boldt presided. Fish-in protests at Franks Landing, September 1978. Photograph by Matt McVay, courtesy of Seattle Times. "He [Judge Boldt] was threatened, he was harassed, but his case went all the way to the Supreme Court and was upheld. And what Judge Boldt did and what the Supreme Court did was not give rights in those cases, they affirmed them. In other words, they said these rights are there." Elizabeth Furse, former U.S. Representative from Oregon, NMAI Interview, August 2017. Elizabeth Furse and her husband were among many non-Indian activists who worked to educate the public about treaty fishing rights during the Fish Wars.